As the country’s capital, and the easiest place to reach, it makes a lot of sense that Ljubljana is where most people head to when traveling to Slovenia. A city with plenty to do, Ljubljana is great for several days of sightseeing, but there are also plenty of things to see in Slovenia outside of Ljubljana. Many of these sights can easily be visited on a day trip from the capital, making Ljubljana a great place to base yourself in. To give you a better idea of what there is to do and see, here are some of the best day trips from Ljubljana. For travelers to Slovenia, one of the destinations you simply can’t miss is Lake Bled. Probably the king of Ljubljana day trips, Bled will perfectly entertain you for a day with its jaw-dropping sights. Your day starts with Lake Bled itself, a crystal clear lake surrounded by forest, and the Alps in the distance. At the center of the lake you’ll find the Church of Mary the Queen which looks as if it came from a fairytale. To reach the church, you can go for a gentle paddle on a traditional boat called a pletna. After that, there’s the clifftop Bled Castle which you’ll want to visit, both for its history and it’s stunning views. Other things to do include walking around the lake, jumping in for a swim, and indulging in a delectable Bled Cream Cake. Also, close by is the gorgeous Vintgar Gorge, where you can follow a boardwalk inside the picturesque river gorge. For more information on visiting Lake Bled from Ljubljana click here. Getting there: Your best approach to reach Bled by public transport is on a bus as they leave every hour and take 1 hour 20 minutes. However, to really make the most of your time visiting Bled and fit everything in, this guided tour is the way to do it. Much of Slovenia around Ljubljana is green and covered in gentle rolling hills, but the country also has a fantastic coastline. In fact, the coastal town of Piran is one of the best places to visit in Slovenia, thanks to its gentle seaside atmosphere. 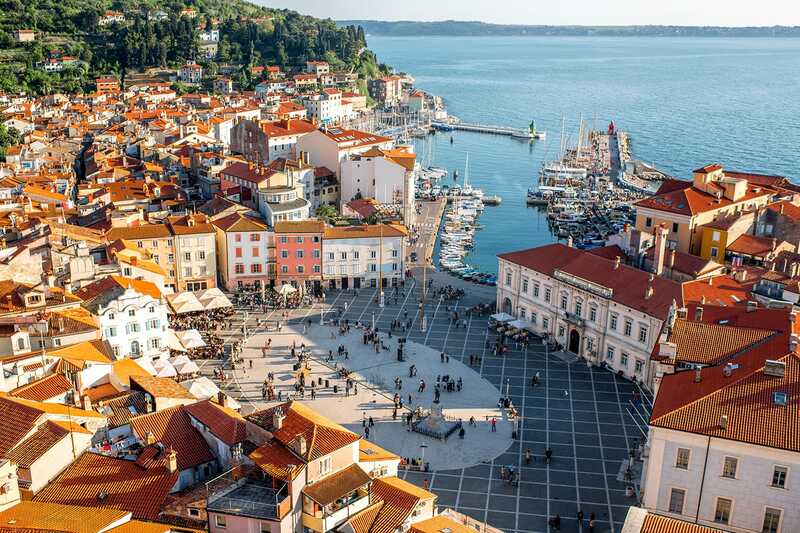 As Piran sits on a small peninsula with limited space, you can expect plenty of narrow, meandering streets weaving through the town’s old Venetian architecture. A trip up to the St. George’s Parish Church and town walls is a great way to see the town in full, while Tartini Square and the neighboring marina couldn’t be more scenic. Down along the Adriatic waterfront, the two main activities involve filling your face with seafood and ice cream, or taking a dip. With more time on the coast, you can always stop in on other neighboring towns like Koper and Izola. Getting there: Not connected by train, Piran can be reached from Ljubljana by taking the bus, first to Koper and then using the regular local connection to Piran. In total this should take a little over 3 hours, which is why choosing to drive the 1 hour 15 minute journey might make more sense. Visitors to Slovenia may be surprised to learn that it’s known for its many caves, with Postojna Cave being its most famous. This great long karst cave system is surely one of the best places to visit from Ljubljana. To visit Postojna Cave, you actually hop aboard a tourist train which weaves its way through the underground network. As you go, you’ll learn about karst caves and see various incredible formations, from a 16-meter-high stalagmite to one that is gleaming crystal white. A short distance from Postojna Cave, and often visited with it, you’ll find another equally stunning sight in Predjama Castle. 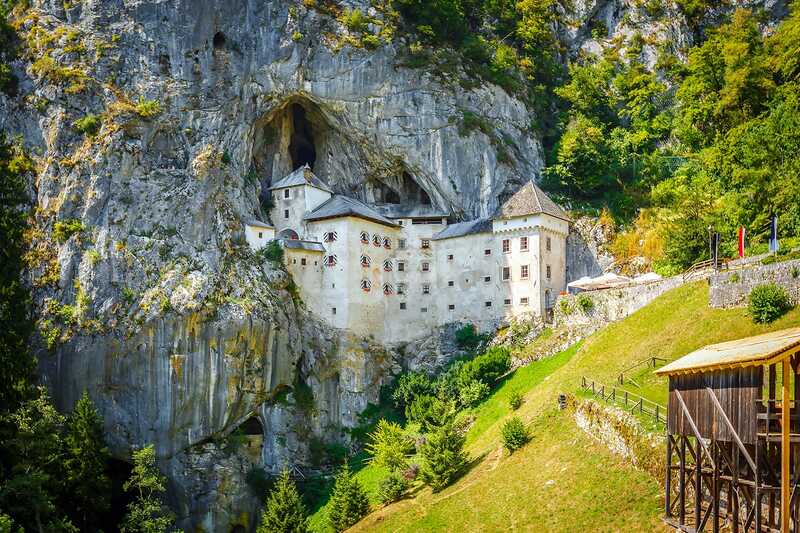 Positioned within a cave entrance, Predjama is the largest cave castle in the world and has its fair share of history. Getting there: For simplicity’s sake, taking a tour to Postojna and Predjama is the best way to go. Otherwise, it will take you around an hour by bus or train, with connections every couple of hours. Getting a dose of nature isn’t hard in Slovenia and one of the best places to go is the Soča Valley. 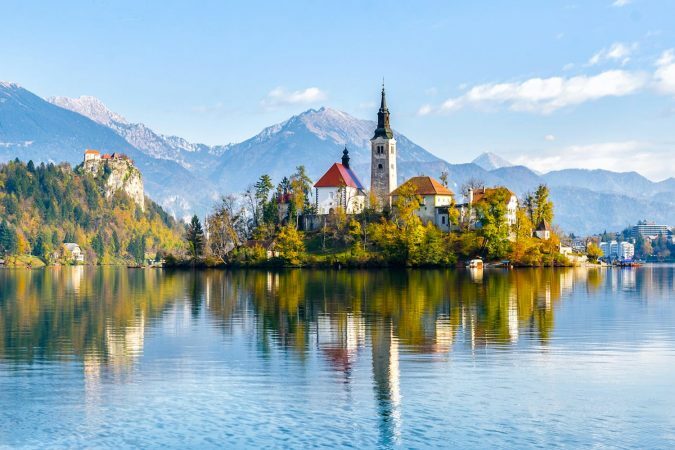 Whether you’re looking for some soothing scenery or the chance to be a little adventurous, day tours from Ljubljana to Soča are the way to go. 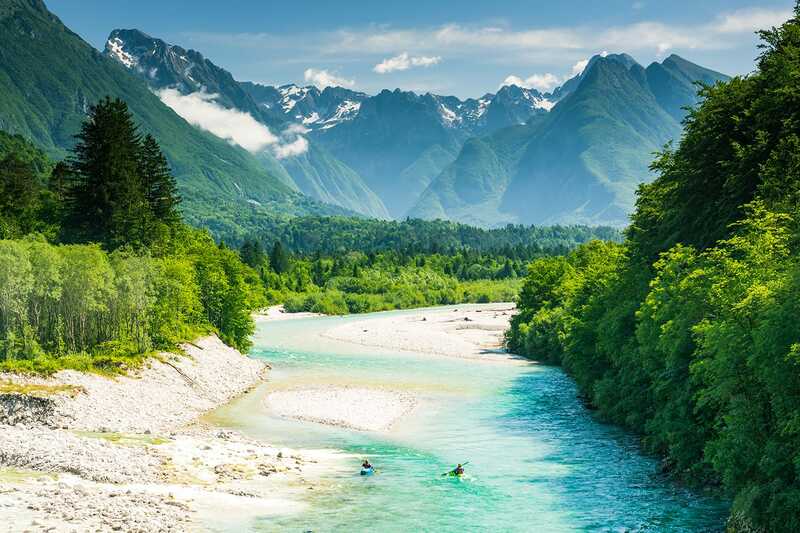 Known for its gorgeous emerald green color, the Soča River flows through western Slovenia in one of the country’s wildest parts. With plenty of cascades and rapids along the river, it’s little wonder the valley has become popular with those into kayaking, white water rafting, and canyoning. The region also has some history surrounding the First World War, which can be explored on WWI walking trails and at the Kobarid Museum. Getting there: Given its remote nature, your best options for reaching the Soča Valley are either driving yourself there or relying on the services of a guided tour. For activities and the simple ease of not having to find your own way around, a guided tour has a lot of appeal. 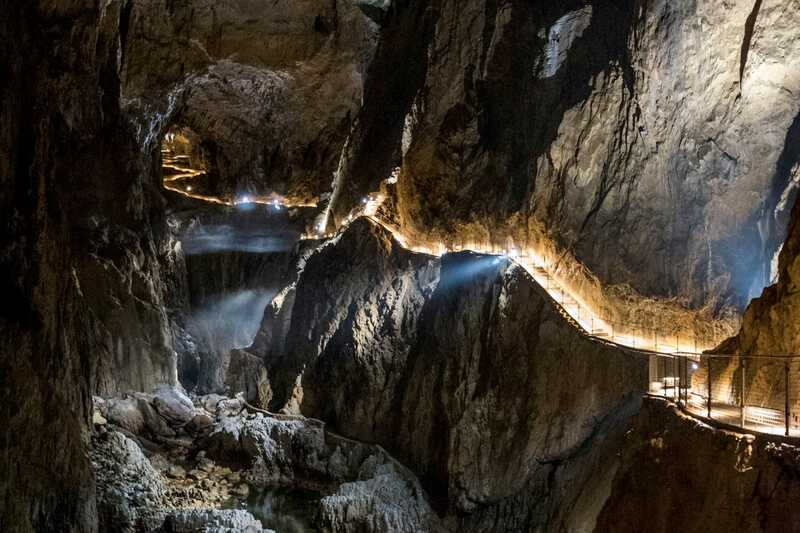 Another special place to visit in the Karst region of Slovenia is the Skojcan Caves. Down near the Italian border, these caves are a UNESCO heritage listed site thanks to their natural and cultural importance. Mainly though, the caves are incredibly popular thanks to the sights and wonders they hold, ones that often have people comparing them to something out of Lord of the Rings. With a walk down through the caves you’ll see plenty of stalagmites and stalactites, not to mention the largest single cavern in all of Europe. Then there’s the deep underground river which you can see flowing beneath you that adds to the atmosphere. Once you’ve reached the other end of the tunnel, you’ll have to climb your way out of two collapsed sinkholes. Getting there: Every few hours there are buses which run from Ljubljana to the Divaca, the nearest town to Skocjan. However, it’s still several kilometers to the caves which would mean walking. Renting a car and driving there yourself is the better option and takes less than an hour. The second largest city in Slovenia, Maribor doesn’t often get the notice it’s due. A visit to Maribor is best started along the scenic riverfront of the imposing Judgement Tower, before venturing into the city’s Old Town. Along the way, check out the world’s oldest grapevine, known as the Black Velvet Grapevine. Further proof that Maribor has wine on its mind, delve down into sprawling Vinag Wine Cellar under the center of the city. Back above ground in the Old Town, sights to see include the old market square and Maribor Castle, where you can learn more about Maribor and its surrounds. Getting there: While there are occasional trains which take up to 3 hours to reach Maribor from Ljubljana, a faster choice is the bus which only takes around 2 hours. That being said, buses only run about every 3 hours. 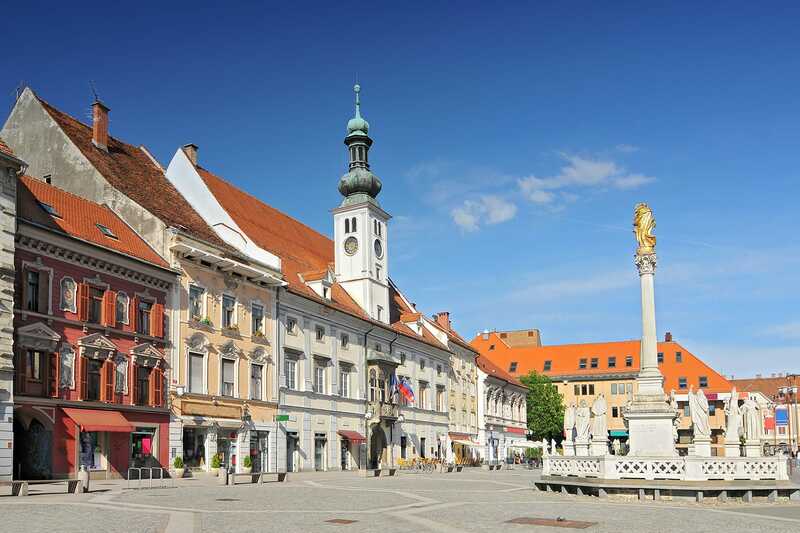 There are also a few tours that go to Maribor from Ljubljana, including stops in Ptuj and Žiče Carthusian Monastery. Once you see the charming riverfront of the town of Skofja Loka you’ll wonder why it’s not more solidly on the tourist map. Just a short trip from Ljubljana to the northwest, Skofja Loka is undeniably pretty thanks to its traditional appearance. Start your visit by crossing over the Capuchin Bridge, but be sure to find other vantage points along the river to see the riverfront at its best. Once in the Old Town, seek out the delightful houses on the Town Square, especially the renaissance-styled La Casa di Homan. Afterwards, walk up to Skofa Loka Castle which watches over the town. Not only is it a pretty castle but it is also home to the town museum and some verdant gardens. Getting there: There are buses to Skofja Loka every half hour which take 40 minutes from Ljubljana. With a rental car, you can get to the town in just 25 minutes and even make other stops along the way. Along Slovenia’s northern borders runs the Kamnik-Savinja Alps, presenting travellers with yet another opportunity to experience the country’s natural side. 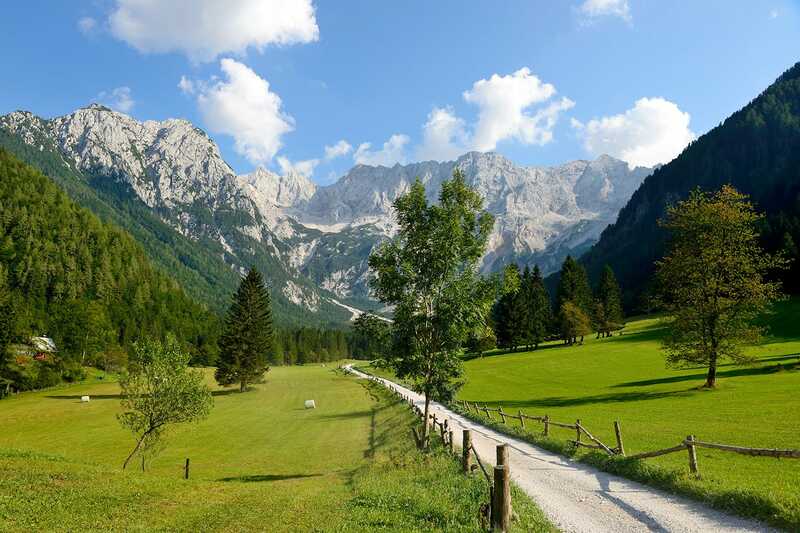 The most popular place to go in this part of Slovenia is the valley of Jezersko, as it grants visitors textbook alpine landscapes and plenty of outdoor opportunities. In winter this means ski slopes, cross-country skiing, and ice-skating, while summer offers hikes and mountain biking trails. Even if you aren’t looking for something very active, you can take in all the beautiful mountain and lake scenery. As you go, you’ll likely spot remote churches and traditional mountain chalets, further establishing the quiet charm of Jezersko. It’s crazy to think that this is all easily reachable from the capital just 40-50 km away. Getting there: To reach Jezersko on public transport, first get a frequent bus to Kranj and then get one of the connections to Jezersko Grabnar which go every 2 hours. The journey should take you under 2 hours all in. Driving on the other hand will only take around 50 minutes. 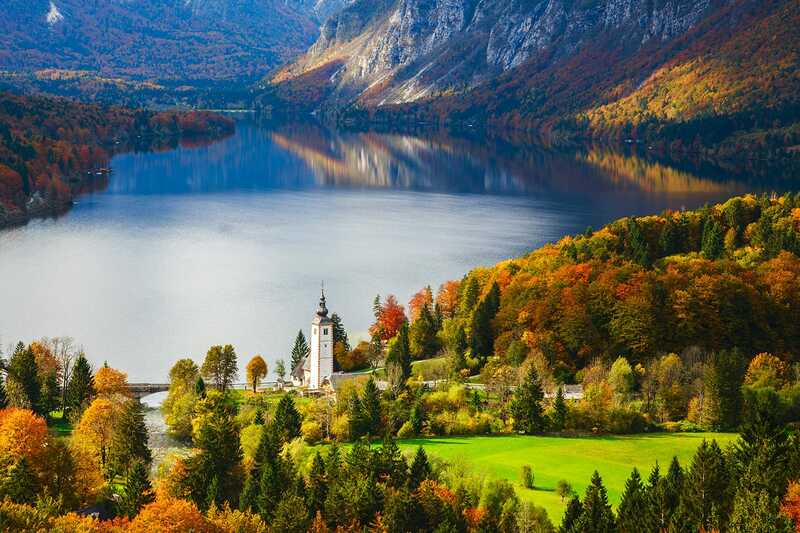 Even with all this talk of Slovenia’s natural prowess, we’ve yet to talk about its crown jewel, Lake Bohinj. With the Julian Alps looming nearby, including the national icon of Slovenia, Mt Triglav. Down at the glacier lake, you can spend a moment admiring St. John the Baptist’s Church, before deciding between a walk along the lakefront or a swim in Bohinj’s sparkling water. It’s in the surrounding area that things get even more interesting, with the Savica Waterfall worth finding, and the Vogel cable car a great choice for some mountain-top panorama shots. There’s also kayaking and mini-rafting possible on the rapids of the Sava Bohinjka river which flows out from the lake. Whatever you want to do in the outdoors, Lake Bohinj has you covered. Getting there: Buses leave Ljubljana for Lake Bohinj every hour, taking 2 hours to get there. Tours are a better option if you’re looking to combine Lake Bohinj with somewhere like Lake Bled. One last city that is easily explored from the comfort of Ljubljana is Kranj, just north of the Slovenian capital. A little unassuming, Kranj is small enough that it can easily be covered in a day, while still offering some surprising diversity. 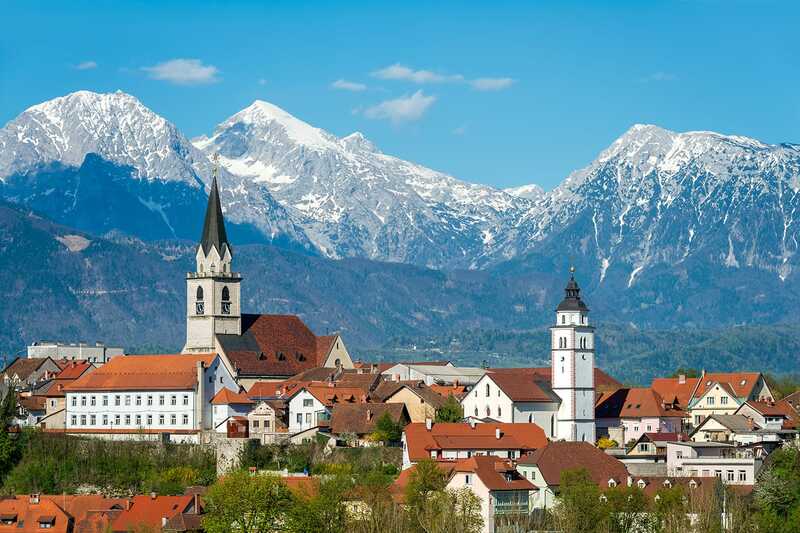 The city’s architecture looks right at home thanks to the ever-present backdrop of the Kamnik-Savinja Alps. As you look from the main Town Square towards the mountains, you’d never know that beneath your feet run World War II tunnels. That is unless you visit them on a guided tour. Another underground sight which is sure to intrigue is the Kranj Ossuary, which features a vault full of bones from locals interred at the church over the centuries. For something more upbeat though, why not take a gentle stroll down in the nearby peaceful canyon which follows the Kokra river. Getting there: Reaching Kranj by bus and train will only take around 30 minutes each way. The only difference is that trains only run every few hours and buses go every 15 minutes, proof that there aren’t many easy train trips from Ljubljana. While Ljubljana may well be the best known destination in Slovenia, we think we’ve proved that it’s not the only one. 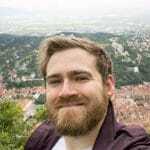 What’s more, the best side trips from Ljubljana do a great job of showing you things and places that you simply won’t find in Ljubljana.